The Supreme Court has ordered an expedited review of a Manhattan judge’s ruling blocking the Trump administration’s decision to ask individuals responding to the 2020 census whether they are U.S. citizens. Census results are important because they are used to allocate federal dollars and determine representation in Congress, among other things. Because time is of the essence, the court allowed the administration to skip the normal judicial appeal route and permitted a direct appeal. The decision to grant speedy review in the case came Feb. 15 at the request of the administration. 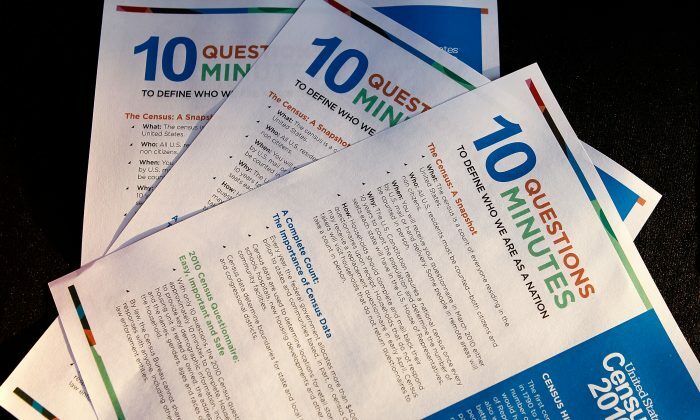 A ruling is expected by June, which would allow the U.S. Census Bureau to honor its schedule for the official questionnaires to be printed. The court ordered the case to be argued in the second week of April. The lawsuit was initiated by 18 states, 15 cities, and civil rights groups including the American Civil Liberties Union. They claim the administration wants to add the citizenship question to intimidate Latinos and illegal aliens into not completing the form, and that this would disproportionately affect congressional representation for Democratic-leaning states with large illegal alien populations. According to one estimate, non-citizens make up about 7 percent of those who reside in the United States. The high court will decide whether the intentions of Commerce Secretary Wilbur Ross in making the decision to insert the question ought to be considered. The case arises out of another proceeding before federal Judge Jesse M. Furman in New York, who found the administration had been acting in bad faith and ruled Ross and other federal officials may be deposed by lawyers for New York state. The administration beat back demands that Ross, whose decision Furman termed “arbitrary and capricious,” testify in the New York proceeding. In October, the Supreme Court blocked the planned deposition of Ross but not of other federal officials. Those challenging the administration’s inclusion of the question say Ross and others in the White House strategized about adding the question before the Justice Department formally submitted a request to include it and that this behavior was improper. Ross said in March 2018 that the inclusion was requested by the Justice Department and was necessary to help enforce the Voting Rights Act. Opponents of Trump’s travel ban affecting residents of troubled, Islamic terrorism-plagued nations, as well as North Korea and Venezuela, argued that the president’s various controversial statements on the campaign trail and as reported in the media were relevant factors for courts to use in ruling on the legality of the ban. Several judges agreed but the Supreme Court eventually reversed their rulings and allowed the ban to proceed. The national, constitutionally mandated, decennial U.S. Census is more important than most people realize. How many seats each state receives in the U.S. House of Representatives is determined by official population figures that come out of the census. This has implications for how much federal money each state receives and how federal funds are spent in each state. The number of House seats affects how many votes each state receives in the Electoral College, the body that, according to the Constitution, meets after each presidential election to officially choose the new president. Republicans and Democrats have fought a tug-of-war over how the census is carried out for decades. Democrats accuse Republicans of scheming to undercount minorities and illegal aliens out of racial animus and hunger for power. Republicans say Democrats try to game the system and use immigration policy to import illegal aliens and new voters to inflate the headcount, in order to increase their hold over so-called blue states and congressional districts.